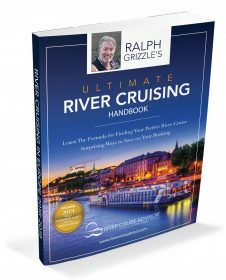 I’m Ralph Grizzle, and I run a website called RiverCruiseAdvisor.com. 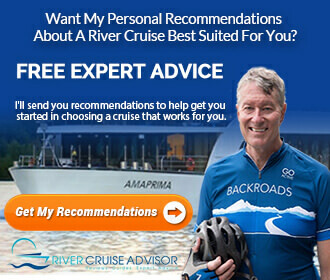 We provide resources to help people make informed choices about river cruises. The Magnificent Europe itinerary that I am on now spans 15 days. You visit five countries on three rivers, plus you get to do the Main-Danube Canal. I think it’s AmaWaterway’s most aspirational trip. It gives you a lot of Europe in a decent time span. What are some of the highlights of the cruise? Some of the highlights of this cruise were certainly Budapest, and that’s a gorgeous city. A big surprise for people on AmaWaterways is that you do an illumination tour. What that is, is that you cruise through Budapest at night when all the buildings are lighted, for about 45 minutes on the ship. It’s simply gorgeous, people come up on the top deck and enjoy that. Also Vienna, that’s always a highlight. You have Schönbrunn Palace there and at the night you have evening concerts and that sort of thing. Some of the other surprises were the Main River. I hadn’t been down that in a long time. Beautiful river. Very cozy, very narrow. You felt like you could reach out to each side and touch the riverbanks. In the beginning, we saw Cologne and visited Rüdesheim, went up in a gondola, and cruised through the Rhine Gorge. That was simply stunning with all of the castles. Beautiful weather, also. How does river cruising compare to ocean cruising? River cruising, when compared to ocean cruising, to begin with, the river cruisers are a lot smaller. Your maximum capacity on a river cruise ship is about 200 people, and that’s the larger ships, or the more-populated ships, let’s say. A river cruiser like this one, 164 people. That’s because on this ship you have two dining venues, you have a pool, you have a gym, you have a complimentary bicycles. Staterooms, they’re fairly equivalent to ocean cruises. I think what’s been amazing about this Magnificent Europe voyage and most river cruises is that you pull into a city, they put out the gangway, and the gangway can be six feet. You walk off the ship, six feet, you’re in the city, and you’re ready for action. It’s not one of these deals where you have to come into a cruise terminal, wait for hours, go through massive security set-ups. It’s just easy. If there’s one word if there’s one word that I think characterized this experience it is accessibility. All of Europe is really at your doorstep. Also, you have things like complimentary Wi-Fi included. Wine and beer are included with lunch and dinner. There is a more personable experience. You could know all your fellow guests and the crew too because you see them every day, particularly on this voyage, which is 15 days. Can you speak about the service on this ship? I found the service to be exceptional. A lot of river cruise companies can say that, they have exceptional service. They can also say they have personal service. I find the service on this particular ship to be probably the most personable that I’ve ever experienced. It’s cliché to say that this crew becomes like family but in some ways they do. At the end of this 15-day voyage, you feel that you’ve become very close to these people in fact. It doesn’t feel put on. It doesn’t feel like they put on a game face. It feels like you see exactly who they are. They really enjoy seeing guests happy. What about high-water and low- water issues? People worry about high and low water and how that can affect the cruise experience. Low water means that the river is too shallow and the riverboat will actually drag the bottom, or get stuck or can’t go on. High water presents another problem. The ship can’t get under the bridges. These are issues that people think about a lot, but they’re not a big issue. I think people give too much thought to these. In 30 plus river cruises, I’ve never experienced it. I’ve experience high water. We got under the bridge. I’ve experienced low water. This ship, this company, they perform exceptionally well in low water. What are the included shore excursions like? With the shore excursions, you typically have two or three in each destination. The first one would be for somebody who has never been to Europe. You get sort of the highlights tour. The second one would be for somebody who has been to Europe but they want to experience something different, or they’ve been to that particular destination and they want to do something different there. Then the third one may be a limited edition, or an optional tour. Limited edition is free, but you need to sign up for that one. The optional tour does cost but that may be like an evening concert in Vienna, which costs on this particular voyage 75 euros per person, but by and large the majority of tours are free. Along with guided bicycle tours and guided hikes for those people who are active, I found the quality of the tours to be exceptional. Some of the tour guides have just been A plus, plus. It’s absolutely amazing. In Nuremberg, for example, the World War II tour, the guide was a true standout. I would say the same about many of the destinations where we’ve been: They have sourced really good tour guides. What about the bicycles on board? AmaWaterways does carry a fleet of bicycles and there are two ways to use them. The first way is they’re for complimentary use. If you just grab a bike and go out, they provide the helmets, they provide water. That’s one way to do it, just get a bike. I did it yesterday in Vienna. I had a wonderful ride. I mean, it was euphoric. That’s the only way I can describe it. The other way to experience the bikes is on a guided bike tour. If you’re a little bit uncomfortable going on your own, they’ve got multiple guided bike tours on this Magnificent Europe itinerary. One was the Wachau Valley, and that was one of the highlights for me on this entire trip. Gratuities are not included in the cost of the cruise. AmaWaterways says it wants its guests to be able to reward their servers in a way that they feel is appropriate, just like you’d do in a restaurant back in North America. How is the WiFi/Internet on board? You have wi-fi on board here. It works exceptionally well. There are parts of the river it’s not going to work at all, but that’s just the way it is with technology. There are other parts of the river where it’s going to work as well as it does at home for you. That’s where AmaWaterways … That’s in Vienna, for example, Bratislava, Budapest, where they actually have a land line. I think of all the river cruise companies at the moment, AmaWaterways probably has the best wi-fi. They have invested millions. Keep in mind that they don’t charge for Wi-Fi. This just something they do to exceed customer expectations. What is the demographic on board? There’s a misperception that river cruising is only for people in their 80s and 90s, and that’s no longer true. 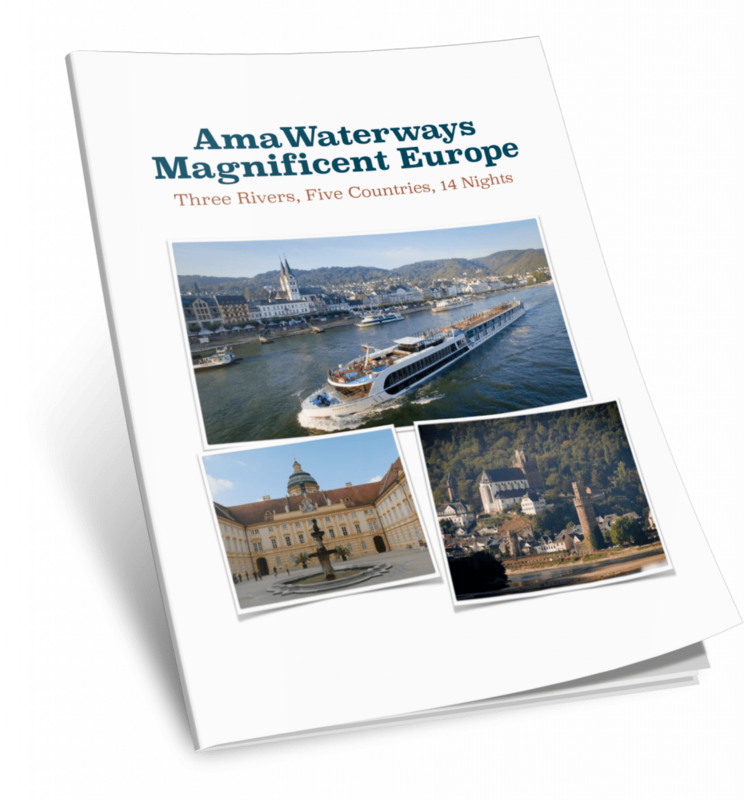 It might have been true a decade ago, but not today, and not on AmaWaterways. This company has strived to bring the demographic down by creating more active shore excursions. We’re travelling with people in their 40s, 50s, 60s, and of course 70s. We may have an 80-year-old on the ship. I don’t know. People have been very active, the bike ride in Wachau Valley, for example, was wait-listed. It’s definitely a younger demographic baby boomers, than it was in the past. I’d recommend the Magnificent Europe Itinerary for several reasons. One is, I like the duration of the trip. 15 days, you really get into the rhythm of Europe and of the river. Number two is that, you sail on three rivers through five countries. You get to see a whole lot of Europe. Number three, you do this on a lot of river cruising, but you have a lot of scenic cruises. One of the things that I … I won’t say that it surprised me on this trip because it surprises me every time I’m on an AmaWaterways vessel and that is that the company always does what the owners intend for this company to do and that is under promise and over deliver. They don’t make bold claims that you’re going to have the best trip of your life and that you’re going to experience champaign every day and this sort of thing. But, what they deliver is an experience that’s personal and really meaningful to you and it leaves you with a lifetime of memories. I would recommend this, highly recommend it to anybody who wants to have a culturally immersive experience in Europe. I’m Ralph Grizzle on AmaSonata cruising on the beautiful Danube river.